One deck $34 Full Brick of 12 Decks for $220! HUGE DISCOUNTED WHOLESALE PRICE!!!! 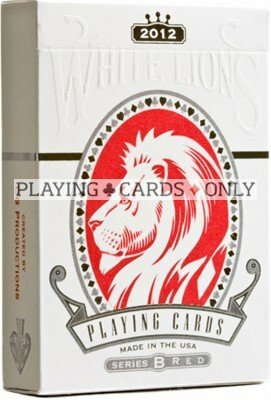 Box design includes silver foil stamping, detailed embossing, and a matte white finish never before seen on any deck of cards. The printing and packaging process needed for this box was so time consuming and difficult that the USPC isn't able to offer this box finish type to anyone in the future. The cards themselves are printed on a casino quality stock and are traditionally cut to allow for an easy weave during your shuffles. The White Lions feature an accumulation of several years worth of ideas. There are many hidden features, valuable to magicians, built into the deck that we will leave for you to discover. The cards also come stacked in the Tamariz stack with the Ace of Spades on the face ready to be unleashed.